Arrive in Quito. Meet and greet with your bilingual guide; then transfer to the Patio Andaluz Boutique Hotel. Two nights, one suite (double occupancy), including breakfast, hotel tax and service charge. After breakfast, meet your guide and head towards the famous Teleferico. 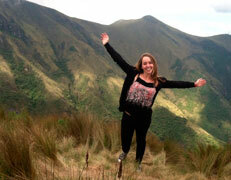 From the hotel, you will drive west towards the Pichincha Volcano, where you will begin your tour. Take the Teleferico cable car up to the top of the volcano. From here, you will have some incredible views of the city, and your guide can explain the different sections of the city from this birds-eye view! After taking in the great views from the Pichincha Volcano, you will head to the Iñaquito Market to begin your cooking tour. Here you will explore the vibrant market, its people and, of course, it’s great variety of fresh produce. You will also learn the local names of fruits and vegetables, how to negotiate prices and how to obtain a “Yapa” (to add a free item to your purchase). Having completed the Tour of the Market, you will drive to Hacienda Rumiloma, spectacularly located on the slopes of the Pichincha Volcano towering over Quito, where you will participate in an interactive cooking class in which the Chef teaches you how to prepare a couple of traditional Ecuadorian dishes. After testing your skills in the kitchen, you will be offered a great tasting menu of food and wine pairings with detailed explanations by the chef. After your cooking/tasting course, you will return to the Patio Andaluz Hotel. 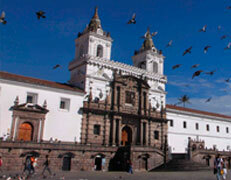 Today you will drive southeast of Quito towards the magnificent Hacienda Umbria. This Hacienda cultivates the majority of its own food, which allows them to host some great food pairings and cooking courses. Upon arrival to the hacienda, you will have a welcome drink before you are lead on a tour of the property. When you are ready, you will choose what you would like for lunch and then spend about an hour in the kitchen watching the chef work his magic. Along with your lunch, you will be given some other food pairings put together by the chef. This afternoon is yours to relax and enjoy the incredible surroundings of the hacienda. You can choose to take a long stroll through the property, go for a bike or horseback ride, or simply relax and take in the views. After breakfast, leave the hacienda and head to one of the colorful markets in the area. Each of the Indian Markets is an interesting cultural experience where you can witness people trading their llamas, horses, sheep, etc. The towns are transformed by a lively, sprawling display of goods brought in by locals from surrounding villages. 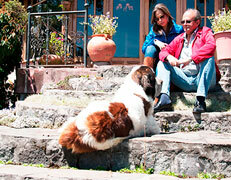 For lunch, you will be welcomed at La Casa del Perez, a local adobe house built by an artist and his wife. This incredible adobe house is not only a home, but also an art studio and gallery as well as a home restaurant. You will be lead through the house by Mrs. Perez, who will explain the various types of art surrounding you. Everything in the house is for sale, so keep your eye out for your next keepsake! After taking your time browsing through the incredible collection of art, you will be served a traditional lunch. After lunch, you will visit a rose plantation. Roses are one of the most important agricultural exports Ecuador has, and here you will learn about the processes of growing, harvesting and shipping roses. After this exciting tour, head south through the lush Andes to Hacienda Umbria for overnight & dinner. Today you will be met by your guide who will drive you along the Pan-American Highway - also named the Avenue of the Volcanoes by Alexander Von Humboldt. In this area you will find Cotopaxi National Park, an ecological sanctuary of 88,920 acres, which is home to the magnificent Cotopaxi Volcano. 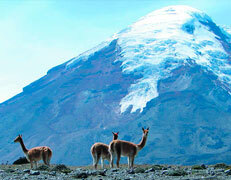 At 5897 meters (19,347 feet) above sea level, Cotopaxi is considered the highest active volcano in the world! You will have an opportunity to take short hikes and learn about the flora and fauna of the Paramo region, Also, depending on the weather conditions, you can visit the “refuge” (4.800m - 15.840ft). 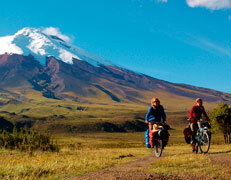 Lunch is at Tambopaxi base camp with a fantastic view of this most scenic volcano. In the afternoon, transfer to Quito. At night you will be welcomed at a family home in Quito where you will experience their way of living, see how they prepare their food, and spend a typical Quitenian farewell dinner. One night at Hotel Patio Andaluz; breakfast, and local taxes included. 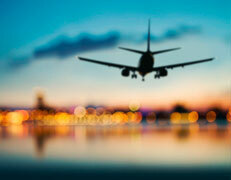 A private transfer will take you to the Quito airport in time for your international flight home.